ETRA the European Twowheel Retailers’ Association has replied to an European Commission public consultation on reducing CO2 emissions from road vehicles. The results of the consultation will feed into the Commission’s decision-making on EU regulations for cars, vans and heavy duty vehicles. The EU is currently committed to cutting greenhouse gas emissions 80-95% by 2050, compared with their level in 1990. in order to achieve this reduction at the lowest cost, the “Roadmap For Moving To A Competitive Low Carbon Economy In 2050” estimates that transport-sector emissions should be cut by 50-70% by 2050. The Commission intends to propose revisions to the regulations for car and van emissions for 2020. For Heavy Duty Vehicles there is at present no EU regulation of their greenhouse gas emissions and the Commission intends to put forward a strategy for addressing these. ETRA replied to the European Commission’s public consultation on reducing CO2 emissions from road vehicles. You will find below the reply sent to the Commission, which highlights the role that (electric) bikes and powered two wheelers can play in the reduction of CO2 emissions. Improving air quality and reducing traffic congestion represent decisive challenges for the environment and for our mobility. Transport emissions account for around a quarter of greenhouses emissions at EU level, coming from cars, vans and heavy duty vehicles. The White Paper on Transport released by the European Commission in March 2011 tackles this issue, as it sets the target of cutting CO2 emissions by 20% by 2020 compared to 1990 levels, and by 60% by 2050 compared to 1990 levels. ETRA believes that it is of paramount importance to reach this target, and therefore strongly advocates a modal shift in the transport sector, from private car use to the use of two wheels, especially in urban areas. ETRA also believes it is important to promote the periodical renewal of the circulating fleet, for instance through fiscal incentives, in order to create a safer and more environmentally friendly fleet. Taking into account the fact that 50% of car trips are done for distances under 5 kms, and 30% under 2 kms, two wheels can provide a simple and very low-cost solution to reduce CO2 emissions. Estimations have been made that if by 2020, the modal share of cycling would be at the same level in Europe as it was in Denmark in 2000, this would save 62 to 139 million tons of CO2. In addition to that, if the level of cycling would double by 2020, the current 24 million tons of CO2 saved thanks to cycling would increase up to 54 million tons. Reducing CO2 emissions will also have a considerable impact on health. In the European Union, every year, air pollution is linked to 300,000 premature deaths; noise caused by transport is linked to 50,000 fatal heart attacks and 200,000 cases of cardio-vascular disease in the EU. The use of two wheels will address those issues and having a physical activity through cycling will contribute to better physical conditions. As for the costs, shifting from private car use to the use of two wheels will not include any additional financial investment. There will be no need for substantial infrastructure investment, and even the investment required is negligible compared to the investment needed in other transport modes. Furthermore, every km cycled costs 1.5 eurocents, whereas every kilometer driven by car costs just under €1. As a result a shift from car to cycle would save the economy some 97 eurocents per km. As regards powered two wheelers, ETRA believes that powered two wheelers are fairly sustainable motorised means of transport especially due to their efficient power-to-weight ratio. Their light weight results in significantly less fuel consumption as they require less energy than a car to move. Furthermore a recent study made by ADEME (French Environment and Energy Management Agency) has shown that Euro3 PTWs greenhouse gas emissions (CO2 in particular) are well below those of the average automobile vehicles sold today. 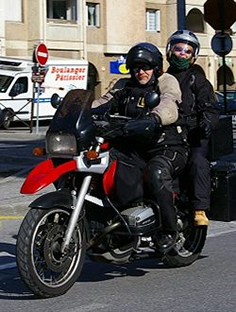 Moreover a study conducted by Transport & Mobility Leuven states that the total external emission cost of motorcycles (all pollutants combined) is 21% lower than that of an average car. In addition the finding of the same study shows that if 10% of car drivers would give up their car for a motorcycle or a scooter, traffic congestion would be reduced by 40%, (the case study referred to one of Belgium’s most congested routes – E40 Leuven – Brussels). The study extrapolates this figure to the entire primary road network and the findings suggest that 15,000 lost vehicle hours could be saved in Belgium every day, which is equivalent to a total time-saving of around €350,000 per day. In conclusion the study shows that if 25% of all commuting trips were made on powered two wheelers, congestion could even turn into a bad memory. Since the European Commission is seeking to reduce emissions and hence to improve quality of life, part of the solution can and therefore should come from (electric) bicycles and powered two wheelers. Whether governments pick this up and put motorcycles – scooters – into their tax bands is another thing but also down to riders and rider organisations to push for this. Regarding “toll charges” I don’t really know, however for example in the UK on the Dartford Crossing motorcycles don’t pay. I suppose it’s down to local authorities, government and toll operators who put these charges in for whatever reasons – pay for road – tunnel – bridge – operating costs. Yes, WHY? 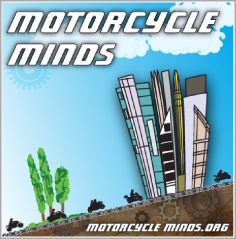 All cars of low emmissions are tax free or lower band than motorcycles. Also why do motorcyclists have to pay 23E for 80 miles of motorway in Italy and 26E to go through Mont Blanc? Having discussed this with biking academic’s at the Uni where I work, as our modern German high efficiency bikes beat the 100gm/km limit, why are we paying Road Tax? IF a bike is better than the cagers limit for tax free and as we use less road space etc, it should be tax free!